Social Forum Journey » Thousands of Cancuns for climate justice! 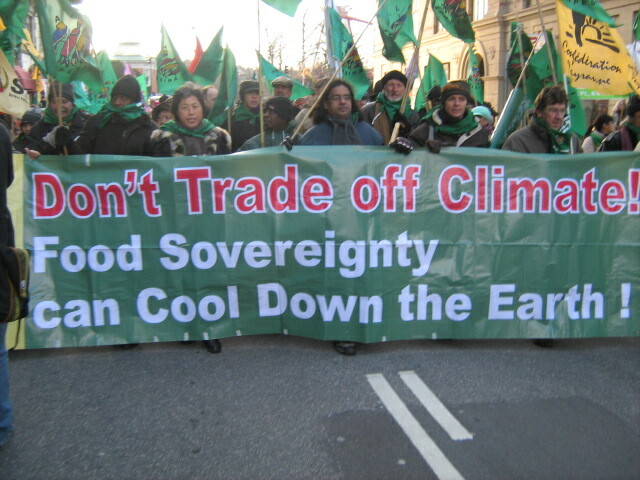 The COP 15 in Copenhagen demonstrated governments’ incapacity to tackle the root causes of the current climate chaos. At the very last moment, the US undemocratically pushed through the so called “Copenhagen accord”, in an attempt to move the debate out of the UN and the Kyoto promises and to favor even more voluntarily free market solutions. The climate negotiations have turned into a huge market place. Developed countries, historically responsible for most of the greenhouse gas emissions are inventing all possible tricks to avoid reducing their own emissions. For example, the “Clean Development Mechanism” (CDM) under the Kyoto protocol allows countries to continue polluting and consuming as usual, while paying low prices supposedly so that developing countries reduce their emissions. What actually occurs is that companies profit doubly: to contaminate and to sell false solutions. Monsanto tries to convince us that monoculture plantations of its GMO Roundup Ready soybeans qualify for carbon credits because they contribute to the reduction of greenhouse gases that heat the planet by accumulating organic matter in the soil. Communities living nearby soy monoculture plantations are a living example of the mortal and destructive effects of these monocultures. Similar false arguments are used to sell carbon credits based on forest monocultures, agrofuel crops, or industrial animal production. Many governments of developing countries, attracted by the potential profits, are betting on these false solutions and refusing to implement measures that effectively confront climate change, such as supporting sustainable peasant agriculture, orienting production towards internal markets, establishing effective energy saving policies for industry, etc. It is now time for the United Nations Framework Convention on Climate Change (UNFCCC) to embark on resolute policies to contribute to solve the climate chaos. Countries need to take strong and binding commitments to radically cut gas emissions and radically change their mode of production and consumption. Climate change also is worsening the migration crisis. The droughts, the terrible floods caused by severe storms, water contamination, soil erosion and degradation, as well as other destructive impacts of the neoliberal environmental disaster, are bringing about the displacement of thousands of people, mainly women and ruined farmers, from their rural communities and forcing them towards the cities and the North in a desperate search for the means of survival for them and their families. It is estimated that 50 million people have been forced to migrate due to the effects of climate change. These “climate displaced people” have come to swell the ranks of the more than 200 million human beings, according to the International Organization for Migration (IOM), that today represent the worse crisis of migration that humanity has faced. Solutions do exist. More than 35,000 people gathered in Cochabamba, Bolivia at the People Conference on Climate Change and for the Rights of Mother Earth broadening new visions and proposals to save the planet. These thousands of solutions coming from the people effectively confront the climate crisis. Defend land and forest rights: The REDD + initiative (Reducing Emissions from Deforestation and Degradation) should be rejected. Protecting forests and reforesting degraded forests is an obligation of all governments that should be implemented without limiting the autonomy, the rights or the control of indigenous and peasant peoples over the land and their territories, and without serving as an excuse so that other countries and corporations continue contaminating and planting tree monocultures. Territorial and cultural rights of indigenous and peasant peoples should be explicitly recognized in any climate accord. Reject geoengineering: Large-scale proposals to deliberately alter the climate, such as biochar; genetically modified plants to supposedly increase reflectivity and resistance to drought, heat and salt; the fertilization of the ocean or the massive creation of clouds, only create new unmanageable problems, they are not solutions. Geoengineering is only one example of how transnational companies are willing to play with the future of the planet and humanity in order to create new sources profit. Reject all carbon trading schemes and Clean Development Mechanisms (CDM): Carbon trading has proven extremely lucrative in terms of generating investor dividends, but has completely failed in reducing greenhouse gas. In the new invented “carbon market” the price of carbon keeps dropping to rock bottom, which encourages further pollution. All carbon emissions should be reduced from the source, rather than allowing payment for the right to pollute. Reject any participation of the World Bank in the management of funds and policies related to climate change. We need millions and millions of peasant communities and indigenous territories to feed humanity and cool the planet. Scientific research shows that peasant and indigenous peoples could reduce current global emissions to 75% by increasing biodiversity, recuperating soil organic matter, replacing industrial meat production with small-scale diversified food production, expanding local markets, halting deforestation and practicing integrated forest management. Peasant agriculture not only contribute positively to the carbon balance of the planet, it also gives employment to 2.8 billion people, women and men around the world, and it remains the best way to combat hunger, malnutrition and the current food crisis. The right to land and the reclaiming for territories, food sovereignty, access to water as a common good and a human right, the right to use, conserve and exchange seeds, the de-concentration and promotion of local markets, are the indispensable conditions so that peasant and indigenous peoples continue feeding the world and cooling the planet. Join us to organize thousands of Cancuns! 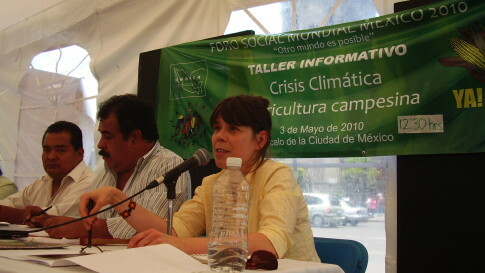 Together with diverse organizations we will set up in Cancun, during the dates of the COP 16, the Alternative Global Forum “For life, and environmental and social justice”, which will unite the force and resistance of peasant peoples of the world, who are already cooling the planet (the Agenda towards Cancun 2010 is attached). We call on social movements, popular organizations and all people of the world to organize on December 7, 2010, thousands of protests and actions to reject the false and market-based solutions. We declare ourselves in permanent mobilization until we defeat the big market negotiations in Cancun in December.